Topics: a franchisor’s obligation to protect brand strength; application of good faith obligations and when courts will blue-pencil contractual agreements. Chris Horkins is an associate with Cassels Brock and Blackwell LLP in the advocacy law practice group. He has a diverse litigation practice, consisting of such areas a franchise, product liability, insolvency, and class actions law, and has appeared before a number of tribunals and Courts, including the Ontario Superior Court of Justice, Ontario Court of Justice and the Ontario Court of Appeal. 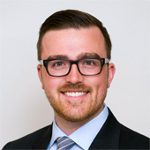 Chris is a member of the Young Advocates’ Standing Committee, which promotes the interests of advocacy lawyers in their first ten years of practice. His franchise litigation practice primarily consists of representing franchise stores, including good faith claims brought under the Arthur Wishart Act and the enforcement of post-termination restrictive covenants. Chris has spoken at a number of franchise law conferences and also frequently writes for his firm’s Franchise Law publication as well as the newsletter of the International Bar Association’s Franchise Law section.